PocketSprungLux futon mattress features barrel-shaped coils for maximum tension. Each coil is heat tempered to “remember” its shape. They then perform as designed long after standard coils lose their bounce. The coil or spring is encased in a non woven fabric pocket that is then secured to a flexible stabilising panel. This creates a system so that each coil moves straight up and down. Therefore it mirrors each sleeper’s body shape and eliminates any rolling together. The PocketSpring provides firm, healthy support like the best conventional mattresses. As a result there’s a flexibile nature that makes it easy to fold your futon into a sofa with ease. Comfort and versatility are ensured with either type of innerspring futon mattress we offer. The PocketSprungLux has the sprung unit sandwiched by x 4 layers of wool felt and x 2 layers of lambswool on top and bottom. The combination of these fillings gives added luxury. 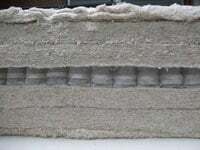 The fillings in the futon mattress are chemical free. All corners are square cut for a neat finish. And because of the care we take choosing and assembling our products there will be very little settlement or compacting. Any mattress you choose will have been hand finished and made in the UK. 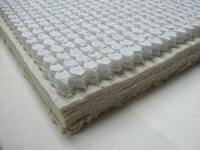 All mattresses are 190cms/ 6′ 3″ in length, except for the 5′0″ option which is 200 cms/ 6′ 6″ in length. In addition we do make bespoke size mattresses on request, so please email or call to discuss your preference..